Looking for exceptional preschool education - look no further! 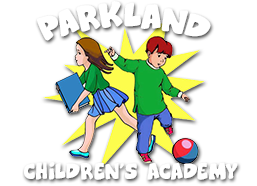 Our goal at Parkland’s Children’s Academy is to provide each student with an exceptional education. Children enrolled in our program grow in all areas of their development including social, emotional, cognitive, fine and gross motor skills, and language. Our philosophy is that children learn best through play. All activities are designed with a specific learning goal. Our curriculum incorporates a variety of learning methods to make sure each child’s specific needs are met. We strive to provide a nurturing environment that encourages exploration and developmental growth.Our staff is selected and trained to meet the highest level of professionalism and educational excellence. We are dedicated to precision in every aspect of our schools program. We believe that our school should provide your child with a loving environment that serves as “a home away from home”. In the early years, birth through age five, children are growing and developing extremely fast. We believe that exposure to age appropriate activities and socialization ensures that children are growing to their full potential. We believe that a strong home and school connection encourages children to strive to become good students and respectful individuals.